Inquisitive Cattle in a field near Pen-Lan-Uchaf and the Christian Retreat Centre - "Ffaid-Y-Brenin". In spite of their fine horns , the Longhorns are noted for their exceptional docility . The Old English breed of Longhorn Cattle was improved for Beef production by Robert Bakewell (1725-1795) of Dishley Grange , Loughborough , Leicestershire , a livestock pioneer of the 1700's. By 1842 they had virtually disappeared, superseded by Shorthorns, which were easier to handle. 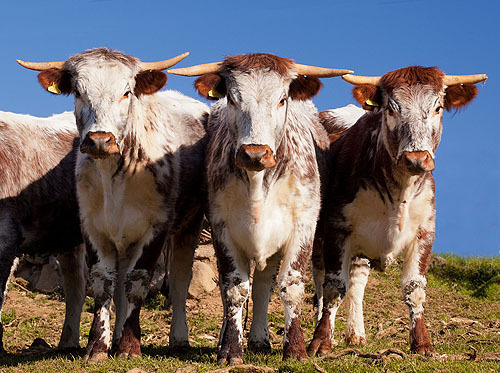 The decline continued until Longhorns were registered on the Rare Breeds Survival Trust list and the number of herds rose from 22 in the early 1900s to well over 100 today.